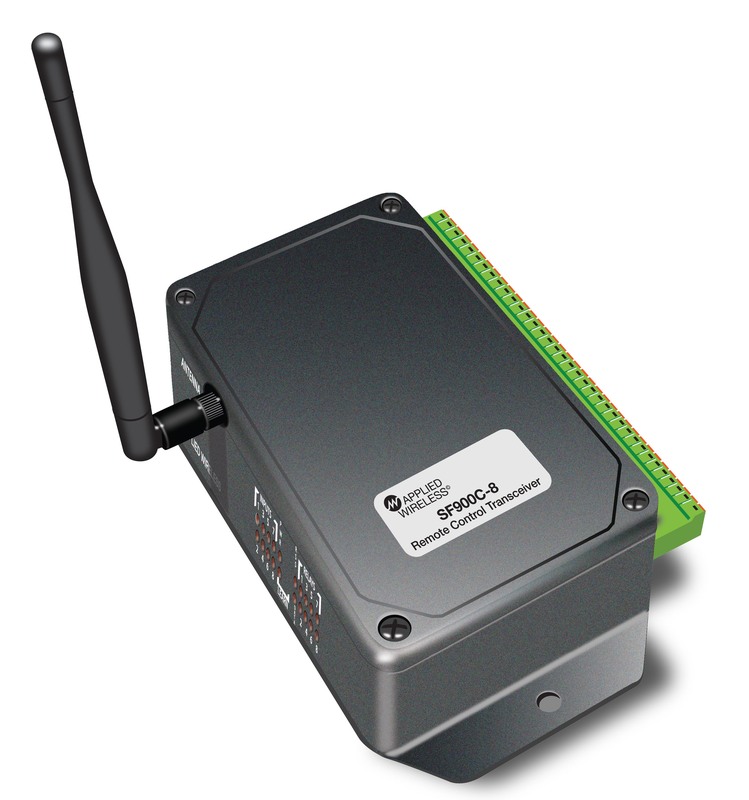 The SF Series products are a two-way system designed to provide a quick and cost effective solution for a variety of wireless switching applications. The SF Series remote control transceiver can be used as long range remote control wireless relays or as a switch “follower”, relays that will “follow” the actions of a single or multiple remote switches. Each SF900C has up to 8-inputs connected to a transmitter and 8-outputs controlled by a receiver. Designed to work in pairs, the output relay at the “receive” end of the wireless link will “follow” the input at the “transmit” end of the other unit. An optional “loopback” mode can be set for each channel separately. This will activate the corresponding relay at the TRANSMIT end confirming that the switch change was carried out at the other end. The inputs are opto-isolated and may be operated by an applied voltage that can be supplied by a power source from 5 to 24 Volts AC or DC through a switch contact, relay, sensor, PLC output etc. Alternatively, instead of automatic switch following operation, the SF900 can operate as an up to 8-channel wireless relay using a SFT900C-8 eight-button handheld remote. In this configuration, latched, momentary or toggle mode outputs are available. When a button is pushed on the SFT900C-8, an RX light will indicate that the proper relay was triggered in the SF900C. Multiple transmitters will work with a single SF900C Base unit. Handheld remote range is 1/2-mile and up depending on the configuration. These products utilize frequency hopping spread spectrum technology and are immune to interference and multi-path fading. All inputs and outputs are independently isolated from each other and from power supply ground. They will not cause interference with wi-fi networks.